Four-and-a-half months after announcing to The Real Deal, with a shift in brokers to stimulate sales, that the condo building 550 Vanderbilt would not lower prices, developer Greenland Forest City Partners has changed course. The developer has lowered prices on at least five units, with the cuts exceeding 10% in two cases, according to StreetEasy listings and previously filed documents. That July announcement, as I reported 10/23/17, was coupled with an undisclosed maneuver that would lower taxes significantly on some units by coupling the condo building with a down-the-block affordable building as part of a "zoning lot." That lowers the cost of ownership significantly, but apparently it wasn't enough. So the July pledge by Forest City New York CEO MaryAnne Gilmartin--prices wouldn't be cut, she told The Real Deal, because 550 Vanderbilt wasn’t your “standard fare development project"--has apparently reached an expiration date. 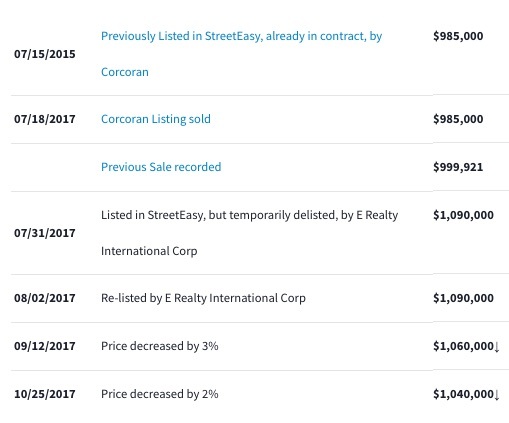 Announced 11/30/17, the clearest price cut is on two-bedroom Unit 1101, as shown in the screenshot from Streeteasy (listing). It was cut $125,000, or 6%, from $2,100,000 to $1,975,000, after being officially put on the market 7/18/17, the date of The Real Deal article. Notably, Unit 1101 was originally--as of the June 2015 Offering Plan--supposed to have monthly taxes of $707, but that was reduced to $51 thanks to the 421-a maneuver. That's a huge savings: $7,872 a year. Without 421-a, the monthly taxes would be $1,601. That's an even larger savings: $18,600 a year. 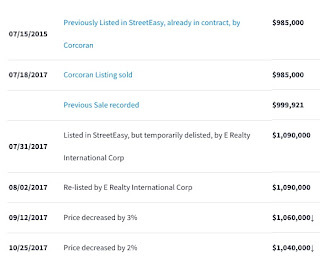 Other newly listed units at 550 Vanderbilt do not come with price changes logged by StreetEasy, either because they were apparently not previously listed at their original prices or their listings were withdrawn. But their currently listed prices indicate cuts compared the price in the Offering Plan. 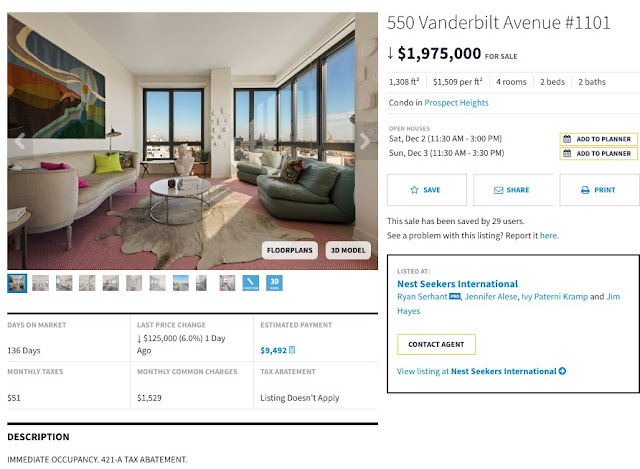 The one-bedroom Unit 506 (StreetEasy listing) is another animal. Its original buyer is trying to sell, and the modest profit sought might not cover transaction fees, depending the broker and legal fees involved. Originally listed a $985,000, it closed on 7/18/2017 at $999,921. Its owner then tried to sell it for $1,090,000, and has cut the price to $1,060,000, and more recently to $1,040,000, while promising to pay transfer tax. That's barely $40,000 more than the original price. City and state transfer taxes for the original deal totaled more than $18,000. Meanwhile, the owner's been paying monthly common charges of $860 and taxes--not the $1 tax rate misleadingly listed (as with other units)--but rather $28.75, still quite a discount off the $908.76 without the 421-a tax break.